Today could be called the last look back at Christmas, the day when some people clear away any Christmas decorations still around. We are now 40 days after the day of celebrating the birth of Jesus. What is celebrated today in the Feast of the Presentation (Candlemas) is based on the story told by Luke in chapter 2 of his gospel, verses 22 - 40. Luke 2: 22 - 40 tells how Mary and Joseph, in accordance with custom and religious law, took their baby Jesus to be presented in the temple. There they encounter 2 prophets, who had each been waiting, praying and longing for the coming of a Saviour. 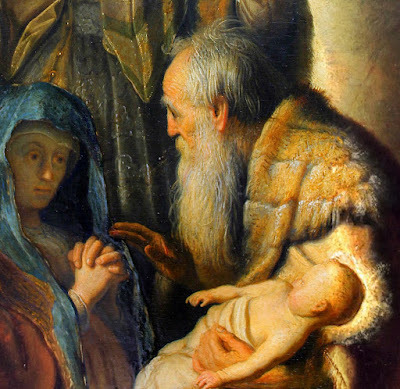 These 2 people were Simeon (who was probably an old man) and Anna (who was certainly an old woman). Both of them recognised in the infant Jesus the one for whom they were waiting and they rejoiced.